This page is dedicated to the women who have allowed Apna Haq to support them. We hope that by watching or reading the personal stories below, you will understand that you are not alone in experiencing violence, but also that it is your right to not experience it. We can help you leave a violent situation. We were engaged for a year, and when he was good, he was great, but when he was bad he was very controlling. I was accused of not being loyal, not being ready for marriage. Things got worse when we got married. His parents would ask what I’d done to upset him. His mum would say “women have to put up with this. As a woman its your duty to be patient with him”. When the police got involved I knew I had to do something. Now, thanks to Apna Haq, I’m going back to university to study. I will get out of this situation. He will not defeat me. This story comes from a lady originally from The Gambia. She had left The Gambia in 2007 to live in Portugal with her husband, where they got married had a baby daughter. She doesn’t like talking about her marriage as he did not treat her and their daughter well. So, she divorced him and after nine years living in Portugal (where she applied for Portuguese residency and successfully got it) she decided to move to the UK to provide a better future for her daughter and herself. Her daughter suffers from Sickle cell disease and requires constant supervision and regular check-up appointments at hospital. The mother has learnt very good English over the years in Portugal and found herself a job straight after their arrival into UK, with help of her friends who look after her daughter overnight when she goes to work for night shifts. Upon her arrival in the UK, she was told that she was not eligible for any benefits. She had to ask for further support at school for her daughter to be safe and her medical condition kept under control. For several months she had to work long hours to be able to manage paying the rent, along with maintaining their basic needs. Then one day, she heard about drop-in sessions that are held for all communities at Eastwood Village Centre and decided to find out a little bit about her rights in this country. A member of the Apna Haq staff team talked to her about what we do and rang the local council about housing benefit. The staff member discovered that she could have submitted her housing benefit application as soon as she started working but unfortunately the lady was wrongly told that she was not eligible and had to wait three months before doing so. Apna Haq arranged some food parcels for the lady, gave some toys for her daughter, and sent some baby items for her friends (also asylum seekers) who would look after her daughter whilst she was at work. Over those few weeks of Apna Haq support she gained lots of confidence and self-esteem, and she feels empowered by her improved knowledge of the UK system and rights. She now knows that she is not alone to deal with her issues. I was born and bred in West Yorkshire where I studied and eventually worked. I had an arranged marriage with my cousin. Initially, as a couple we were happy however, we lived with my in-laws so there were issues around power and control. Living in one house meant that I was expected to care for everyone, being the daughter-in-law. I was made to cook, clean and do all the household chores without help. Later in our marriage, I discovered my husband had mental health problems which the family overlooked. He always supported his family and he was easily swayed by whatever they told him. This eventually lead to him controlling me by questioning my activities, where I went, who I saw etc. My husband did not like me having any contact with my own family because my husband believed they “brainwashed” me into doing things against him and his family’s will. Soon after, even when we bought a house of our own (which was down the road from my in-law’s house), they were still very controlling and interfered too much. My husband was always between jobs. I had children at this time and was pregnant with a third, but I still took up a job in order to keep the mortgage going. I earned a decent wage, but my mother-in-law found out and later began instructing my husband to take control of the finances in the house. Whenever I objected to this, he would physically abuse and hit me. There was constant verbal and emotional abuse directed towards me, from both my husband and in-laws. My sisters-in-law were permitted to dress smart to go to work (western clothes) but whenever I did so I would be accused of having a bad character and my husband would be criticised for being a ‘weak’ male. My husband was very possessive and jealous of me and always ridiculed me by making me feel I was not good enough for him and his family. He did not contribute towards me or the family, so I was responsible for the upbringing of my children and looking after them. On many occasions, our house was on the verge of repossession and because he refused to work he would pressurise me into borrowing money from my family and friends to cover costs. I felt belittled and ashamed at having been put in a position where I was dependent on others. Many times, his sisters and mother would condone that violence was a norm for them and claimed that I had to put up with it from them since they had been through it from their in-laws. As my children grew older they noticed the constant fighting and aggression. I begged for my husband to not show violence in their presence. At my behest he reluctantly resorted to “silent” abuse (emotional and mental) by completely ignoring and not communicating with me. It got to a point where I felt extremely depressed and contemplated suicide. He often played the victim and made out as if I encouraged him to abuse me and his family supported this claim. I myself began to have mental health issues where my self-confidence went extremely low; I doubted my capabilities in my social roles as a mother, as a wife, a daughter-in-law and even a worker. My parents were going on the holy pilgrimage to Mecca at the time (they live in Sheffield). I was not allowed to meet them however I especially wanted to, given the occasion. I made a trip to Rotherham without his permission with my kids. I dropped my sons off to my sister and took my daughter with me to go to my parents’ house. On the way, I got a call from my husband who threatened me for going against him. My daughter heard this and was terrified when we realised he had followed us all this way (I spotted his car in the rear mirror). He got out of the car shouting and swearing at me, and I was too scared to open the door. He tried breaking the window with his hands and my daughter was screaming. He ran back to his car and it seemed he was looking for something to break the window with. I drove off and got my daughter to ring 999. The police showed up and helped me to get home to my parents. They referred me to Apna Haq who then helped me to access legal support and apply for injunction for the safety of myself and my children. Apna Haq supported me with getting support from IDVA (independent domestic violence advocate), housing/accommodation, counselling etc. I feel that Apna Haq have been the best thing that ever happened to me. With their support I have been able to obtain a civil and Islamic divorce and I am now trying to rebuild a life for me and my children. I had an arranged marriage in India in 2012, where my husband and I were both happy. A while later, my husband and in-laws came back to the UK and applied for my visa to call me here. However, my case was refused and went to appeal at the Home Office. In April 2015, I eventually came to the UK and joined my husband and in-laws. I was so happy and dreamt of a happy life for my husband and me. However, during the journey from the airport to our home, my husband did not say a word. He completely ignored me. I lived with my in-laws and expected to look after them by cooking, cleaning, and doing all the household chores. But, in fact I was treated like a slave; I was made to eat leftovers and I was not allowed to go outside or even see my own family members who also lived in the UK. I was not allowed to even speak to them on the phone. My husband would not come home at night and refused to even let me sleep in his bed. He abandoned me and said he did not fancy me as I was not good enough to be his wife. If I ever resisted or questioned him then he would physically hit me and throw me out of the room while verbally abusing me with swearing and shouting. This would wake up other family members and I would be subjected to abuse from them too. My brother-in-law had made sexual advances and threatened me that if I told anyone nobody would believe me because his family knows he has some disabilities. He touched me inappropriately by sliding his hand over my shoulders and back. When I tried to stop him, he hit me. He even said his brother (my husband) had allowed him to do this to me. I never told anyone because I was scared of the consequences. However, when I couldn’t bare the abuse from my in-laws any longer, I rang the emergency number and asked for the police who helped me to get away from the abusive situation. I felt at the time I was mentally disturbed, and had I not got help then I would have given up my life. I was moved to Rotherham with my family members and was given information to contact Rotherham Rise for further support. I contacted them and was told someone from the organisation would call me. However, I waited for two weeks and I did not hear from them at all. As my situation was desperate and I needed help with immigration status and safety, I then contacted Apna Haq who helped me straight away by enabling me to access legal support and a solicitor. I had DDV concession* within a week and was then able to access other services and benefits. Because of Apna Haq’s support I have been able to start a new life and they have helped me to become more independent. *Destitution Domestic Violence (DDV) concession is for people on a UK partner visa to claim public funds (benefits) while applying to settle in the UK because of domestic violence. At the end of 2016, a lady came to Apna Haq who was suffering from various forms of on-going abuse from her husband and in-laws. She was physically assaulted by her husband, who pinned her down on the floor on various occasions. Naturally, she feared for her own safety as well as the safety for her children. Alongside being subjected to on-going verbal abuse, name-calling, and taunting, she received threats to deport her back home to India if she did not listen to her husband and in-laws. The lady had no recourse to public funds in the UK and felt powerless to leave her situation. She informed Apna Haq that throughout her pregnancy she was treated as a slave, expected to care for her in-laws and was expected to cook, clean and carry out all other household chores. The in-laws condoned violence as this was a norm in their family. When she told her mother-in-law of her husband’s abusive behaviour, she was told to put up with it as a dutiful wife as that was what the other women in the family had done before her. The lady’s finances and independence were completely controlled and curbed by her in-laws and husband: she was not allowed to go out alone; she was not allowed to attend any ESOL (English for speakers of other languages) classes to learn English; and she was not allowed to have any social interaction or make friends. She was also forbidden to contact her family abroad without her in-law’s permission: they would stand by her when she telephoned her parents in case she divulged any information about the abusive behaviour of her husband and in-laws and how she was abused by them on a regular basis. Her husband would abandon her for periods of time and she would be solely dependent on her in-laws for financial support. They would only give a very small amount of money per week which was not enough to make ends meet. She often went to bed on an empty stomach so that her children had enough food. Through the support of a neighbour and with police intervention, she was removed from the family home due to safety concerns for both herself and her children. Social services were involved as she was deemed high risk and the children were put on child protection. She was told that due to the level of abuse she had suffered from the hands of her husband and in-laws, if she decided to return to her husband, her children would be placed in social care. However, she was still blamed by her in-laws for putting her husband through this dilemma even though she was not responsible for any of their behaviour. With support from Apna Haq she is making progress and slowly picking up the pieces and rebuilding a life for her and her children away from the abuse she was subjected to. This is difficult due to how severely her confidence was knocked down by the on-going abuse. 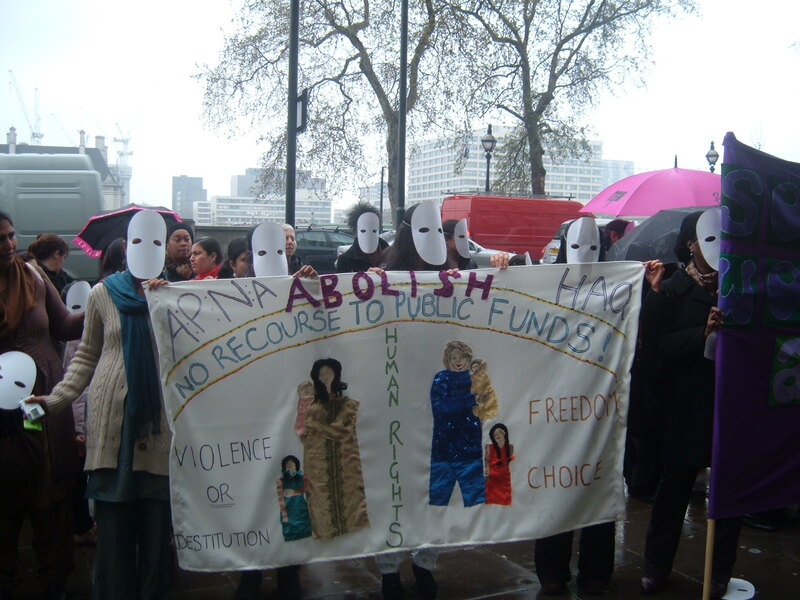 Apna Haq has supported her both emotionally and practically by providing on-going advice and advocacy support, and interacting with other agencies including benefits, schooling, social care and legal services. I lived in Albania and eloped with my husband when I found out I was pregnant. He promised to look after me. My family closed all doors on me and shunned me out of their lives when I refused to give up the man I loved and refused to abort my unborn baby at the time. They did not want to have anything to do with me after that. I had nobody. After I had my baby even my husband changed. He got into the wrong crowd and went off the rail. He got into bad company with drugs, alcohol and he wouldn’t come for days. I used to sit all day waiting for my husband but he would only come when he wanted to. Once he came after a week. He didn’t care about me or my daughter. Each time I asked him where he had been or why he has come so late he would get very angry at me and become violent. He told me that he is working for a big company but I had no idea about this. On one occasion when he came home after a week and I questioned him then he punched me and beat me up badly. I had bruises everywhere and black eye. Once I received a phone call that my husband has been involved in a car accident and is critical in hospital. I was told that a taxi would come and take me to him. It all started from there onwards. I was taken from place to place, I saw different people, and sometimes I was blindfolded. I didn’t know what to do, where I was being taken in the back of a lorry but was worried about my husband and needed to get to him. Eventually, I realised I was in another country – Italy. There I was raped by the man that was holding me and I was forced into prostitution. Later I learned there was a gang involved and they threatened they would kill me and my daughter if I refused. I realised I was victim of human trafficking and my husband was part of this gang. The ordeal I suffered ended in me being hospitalised and it was there when I disclosed about the abuse that I got help to escape and come to England. Since coming to UK, I am really scared that the traffickers will find me and force me back into prostitution. Recently I have received threatening phone calls and texts from my husband that he is looking for me in UK and will kill me when he finds me. Apna Haq has been supporting me to sought legal help and access solicitor to represent me in court as my husband has applied to have contact with my daughter which I am disputing. They will also help me with the cafcass and court process. I am receiving regular emotional support and I am continuously informed about any events or community functions running locally that are relevant or beneficial to me. I am 27 years old and I have a one-year old son. I have been physically, emotionally and economically abused by my husband. He would swear at me, threaten to take my son away from me, and take money off me. He did not allow me to wear makeup, to have nice clothes, he did all the shopping and got me very little to eat. Also, he was kicking and slapping me, burning me with cigarettes, all resulting in scars. the abuse lasted a year. What made my situation especially difficult was the fact that I had been in the UK for five months. I came from the Czech Republic and I have no family here; I was completely isolated as my husband did not allow me to make friends. Also, as I was not working, I was not entitled to any benefits or housing in my own right. I reached out for help through REMA, a local voluntary organisation that runs a Roma drop in session. One day when they came around to my house, they heard my husband shouting and swearing at me. I shared how my husband was treating me. They said there was a women’s organization for women like me that would be able to support me. Three days later when my husband beat me up to the degree that I was unconscious on the floor, I decided the next morning that I had to leave. I was too scared about what he would carry on doing to me, if I did not leave. I went to the Roma drop in and they took me to a women’s organization. I arrived at the women’s organization at 11 in the morning. They got me some nappies for the child and food, and then they rang the social services to say that my son and I needed support. Social services staff came out at five o’clock and they took me to a bed and breakfast. I was only able to communicate with them through the ROMA drop in workers, who stayed with me to make sure that I was okay. The women’s organization provided me with food and toiletries while the Roma drop in workers brought me some food and clothing. The social services kept me in the bed and breakfast for four days and told me that I had two choices: either they could accommodate my child but have no responsibility for me (take my child off me), or that I could “voluntarily” return home together with my son. The social services could not be responsible for me, as I had not earned any social benefits during my short stay in the UK. I took the second option, and thus was put on an 18-hour coach journey to return to the Czech Republic. The women’s organization provided me with food for the journey and some money for when I got there. After arriving in the Czech Republic, I did not feel safe in going to my parents’ home town, as my husband would have been able to find me easily and inflict further abuse, which he had threatened to do. So I remained in another big city. I sought accommodation in a refuge but was turned down. The Czech authorities classed me as having no residency rights as I had been out of the country for more than three months, thus I was not entitled to any support. My son was taken into care for three weeks, since I was homeless. My health has suffered greatly, initially from the abuse I have suffered, I have scarring on my body from the cigarette burns my husband inflicted on me as a permanent reminder of the physical violence I was subjected to, I am extremely thin, my mental health has suffered greatly, initially from the domestic abuse and then from the way that I have been treated by the authorities in the UK as well as in the Czech Republic. By being sent back from the UK and having my son taken away from me in the Czech Republic due to being homeless, I have been given the feeling that I am a worthless human being that has no right to family life. I am very fearful of how my life is going to proceed but I have my son to look forward to. Currently, I have a small room to live in, and I have got my son back. Given the level of racism that I face on a daily basis here in the Czech Republic, I want to be in a position where I can exercise my right as a European Union Citizen to go and live in the UK. However, unfortunately, this is not possible at the moment, as I do not have the money. If any of the stories above have affected you, or you relate to the situations described, please contact Apna Haq for advice and support.